Living with diabetes is not easy. Type 2 diabetes is serious and there is a lot to do each and every day. But, you can learn how to better manage your diabetes. Choose a goal and make a plan. By taking it one step and one day at a time, you can do it. Remember, your health care team is here to help. Here’s the tip sheet [pdf]. 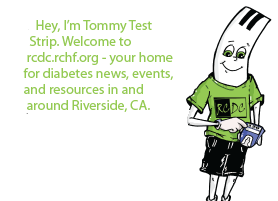 Welcome to your home for diabetes news, events, and resources in and around Riverside, CA.